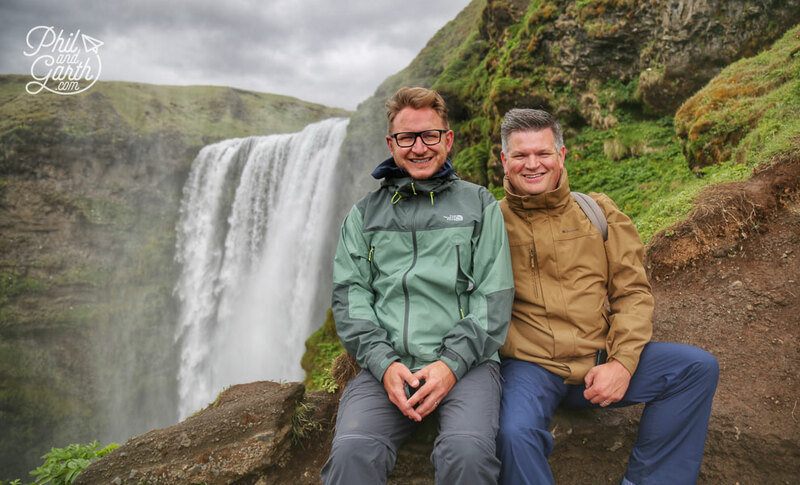 After landing at Keflavík instead of heading into town with our cases we took the Flybus straight to The Blue Lagoon to indulge with a few beers and a relaxing soak before we started our mammoth road trip of a few days to see mother nature’s wonders of South Iceland. Some things at the Lagoon have changed, like their logo, but it was just as relaxing as the last time we visited. (read about our previous visit) The bins of silica mud have been removed and replaced with a swim up booth. Another new feature was a quieter area hidden away under a bridge. As you swim under you are greeted with a young lady in a fabulous swimming hat clutching an arm full of noodles, no not ramen, but those foam floating tubes. Garth got one, Phil was too proud however two minutes later swam back to the colourful swimming hat lady for one and we floated round for the next hour. Then it was on to our perfectly central, low cost, and homely accommodation for the evening in Reykjavik at the House of Spirits to get some kip before the big trip began the next day. 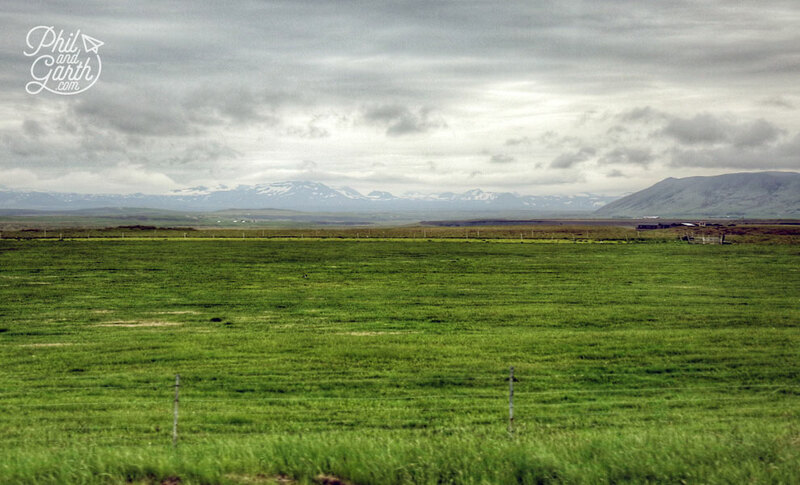 As we leave Reykjavik we’re reminded of how the country harnesses the natural power from their land. 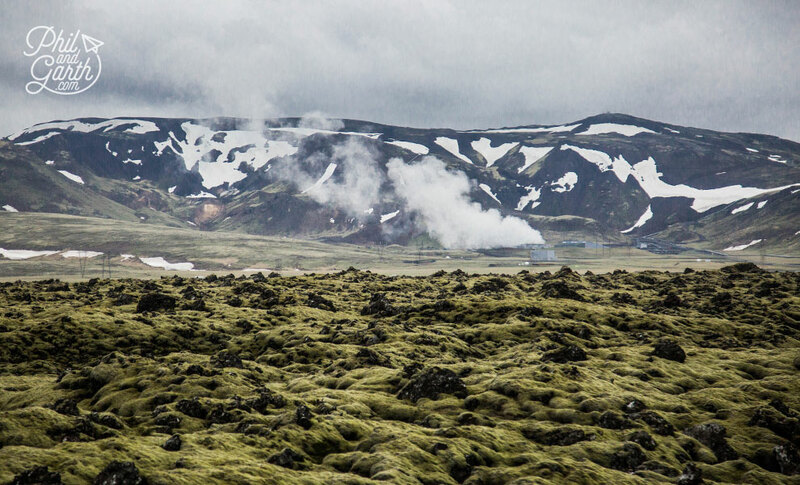 The lava fields nearby have power stations built on active volcanoes creating geothermal energy. We passed Hveragerði where we stayed last time (Read about that here) Hveragerði looked completely different to the winter landscape we saw previously. Only the very tops of mountains are decorated with snow in the summer. The town still looks like something out of the X-Files with its masses of glass greenhouses and hot spring steam popping out of the mountains everywhere you looked. 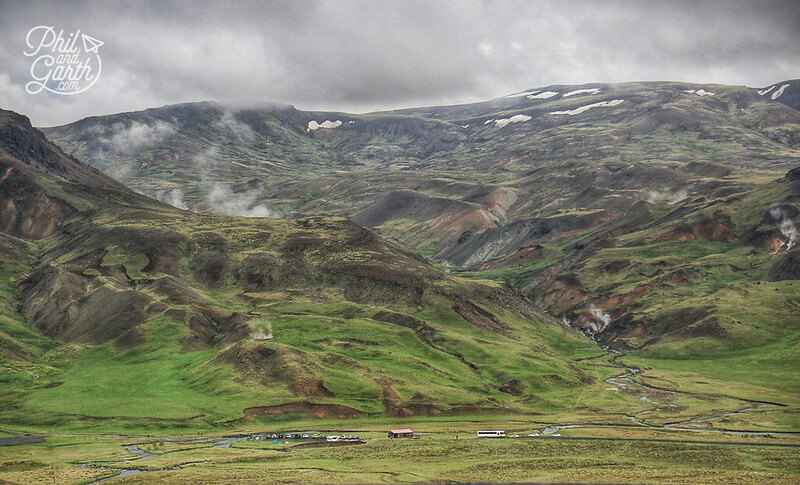 Hveragerði is the greenhouse capital of Iceland they even grow grow bananas using the natural heat in the area. It also known for the biggest earthquakes. After an earthquake here, no one knows which hot spring will stop and where the next one will appear. 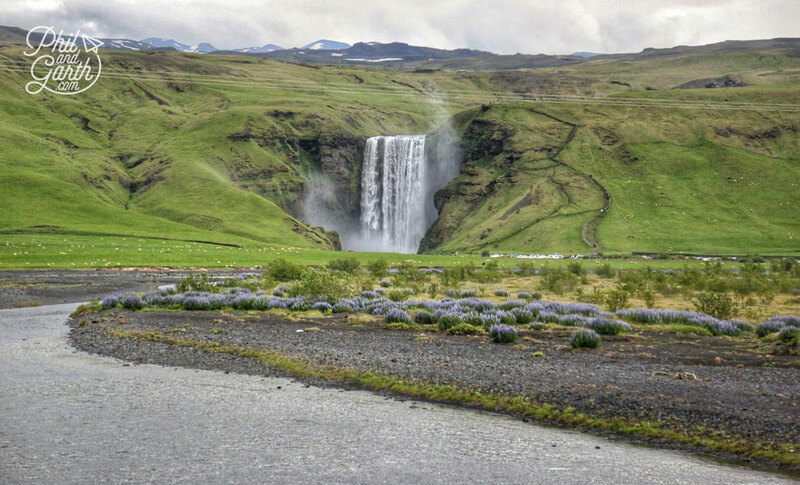 Our final destination in South Iceland was Jökulsárlón so along the way we visited various ‘Foss’ or waterfalls. 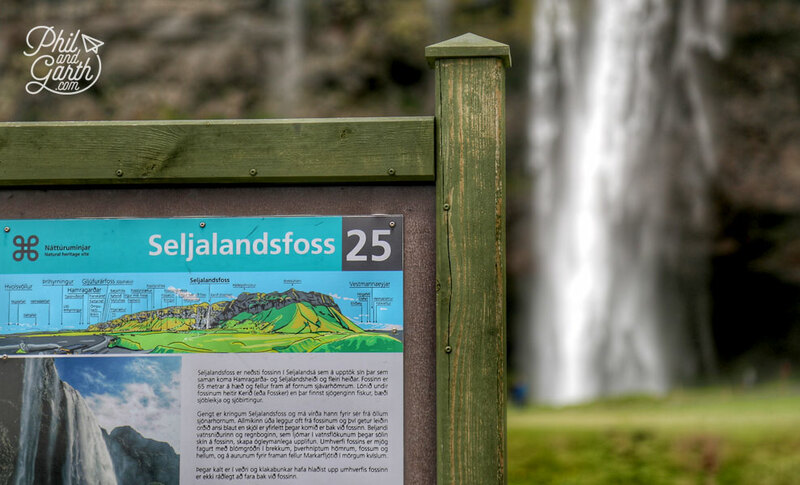 Our first stop was Seljalandsfoss. 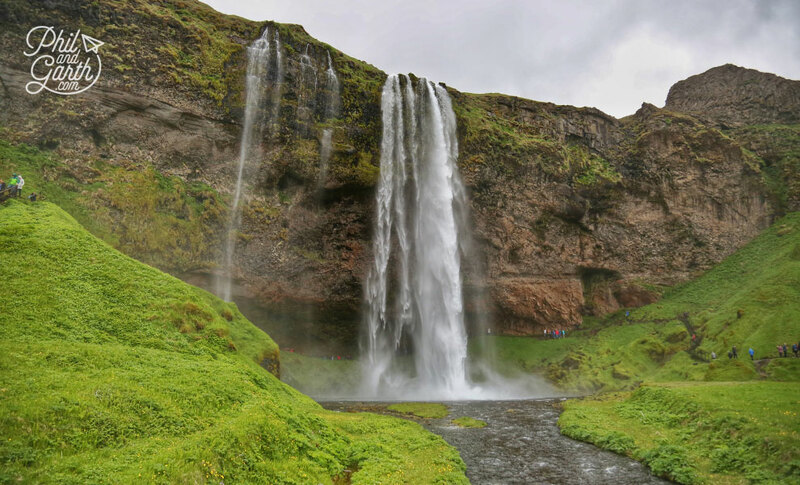 It’s a really beautiful waterfall that plunges 60 metres down from its cliff edge that was once a sea cliff. At the bottom you are standing on what was once the sea floor. The water comes from the volcano and glacier Eyjafjallajökull. What is unique here is that you can walk behind this waterfall in a cave that was carved out of the rock by the sea millions of years ago. It’s really photogenic! A ten minute walk along the path at the bottom of the fall will bring you to another waterfall hidden away in a cave. Just walk along the river to get inside. The cave was formed in the same way millions of years ago by the sea. Spectacular! Get yourself into the cave it’s wet, so make sure you’ve got waterproof hiking boots and a waterproof camera. Back on the road, and we ventured further into the wilderness. The farm land really is flat for miles – they’re actually floodplains formed by glaciers thousands of years ago. 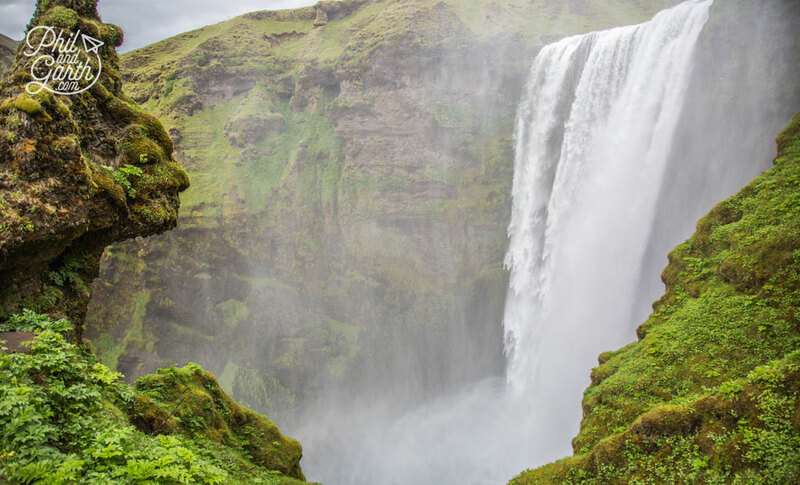 The spectacle that is Skogafoss is considered to be the most famous waterfall in South Iceland, you can see why it’s really beautiful. 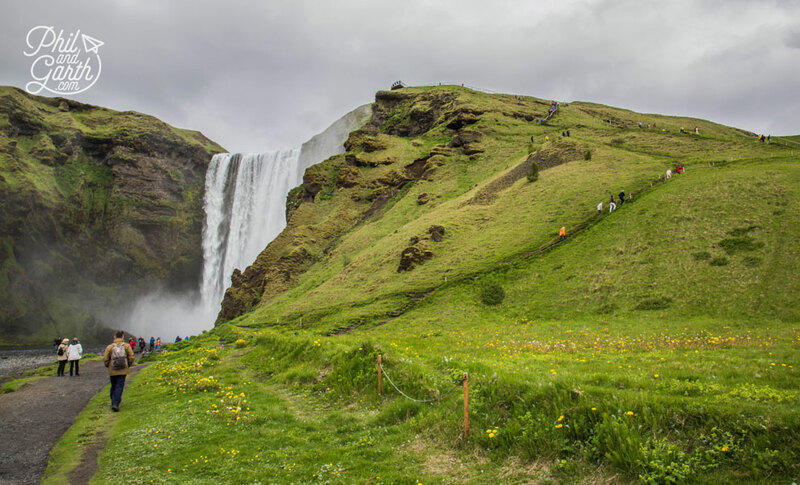 Unlike the previous foss you can’t go behind it, but it’s Skogafoss’s scale that’s been used for countless wedding photos, so if you want the waterfall money shot head here. 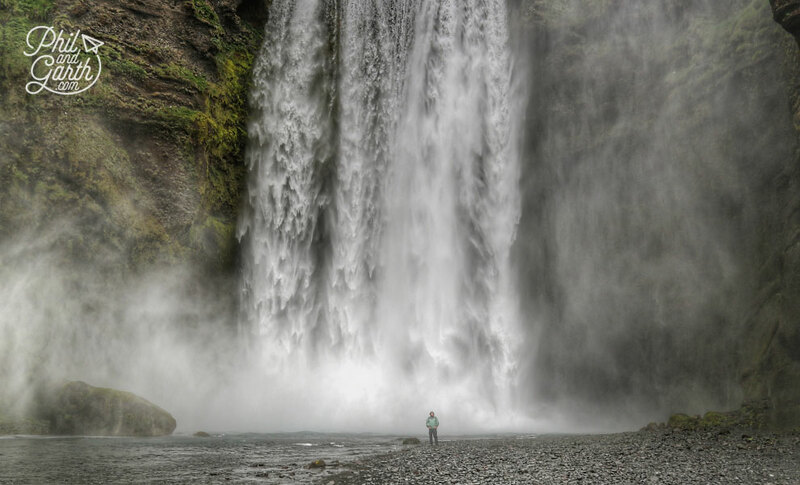 It’s an incredible standing right at the bottom of this thundering waterfall which sounds great, aswell as it looks. The force of the water even looks like it moves in slow motion as it comes down. … or right at the top! We didn’t do this because Phil had a dodgy knee that day (or so he said) The steep stairs are quite a workout for your legs! 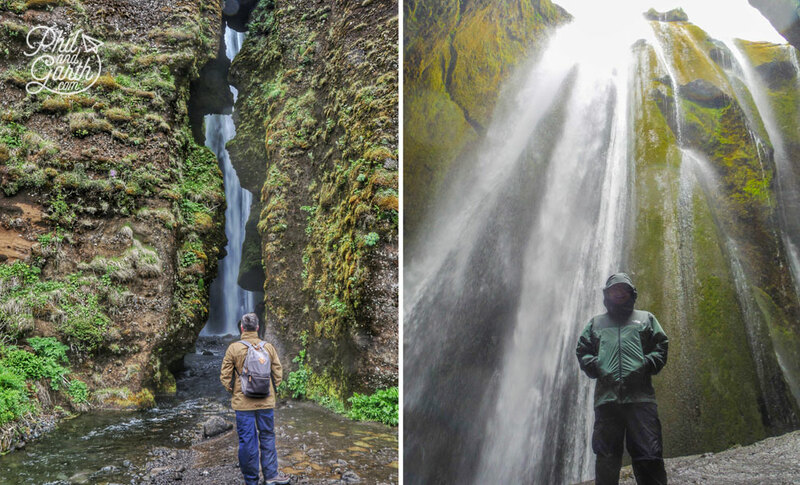 If you want to do a hike, at the very top you can continue walking for a few hours to Þorsmörk, where you will pass other waterfalls along the way. 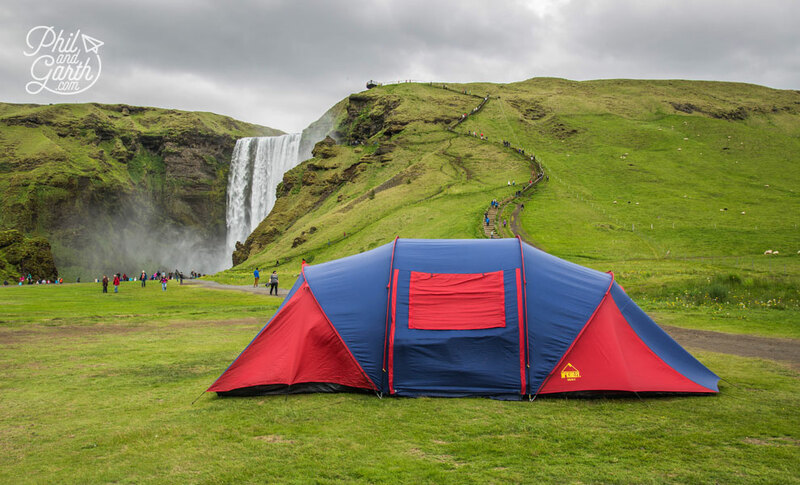 One of the best things we thought about Skogafoss is that you can camp right in front of it! How amazing would that be ?! Road trips are so good, as the scenic drive is a highlight in itself, passing very different landscapes only an hour or so from each other. 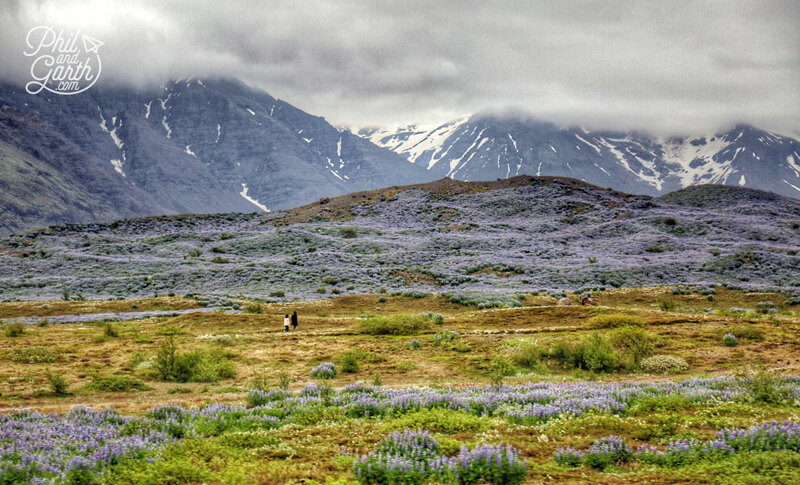 Garth’s favourite were the thousands of blue lupines that cover the ground in mass clumps in Iceland’s summer period. They’re not native – instead from Alaska. Originally seeded deliberately to stop sand storms and because they help correct soil erosion, so that one day they will give way to other plants. 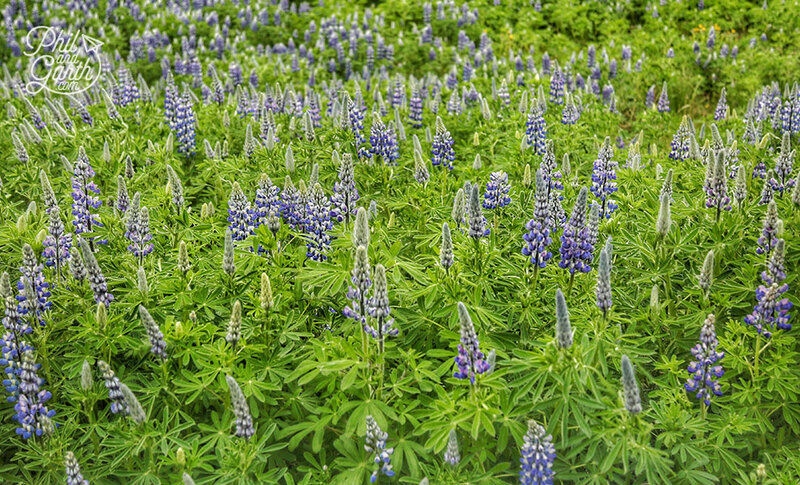 Today these plants are quite invasive, and not all Icelanders like them. Look familiar? Noah was filmed here along with Game of Thrones. 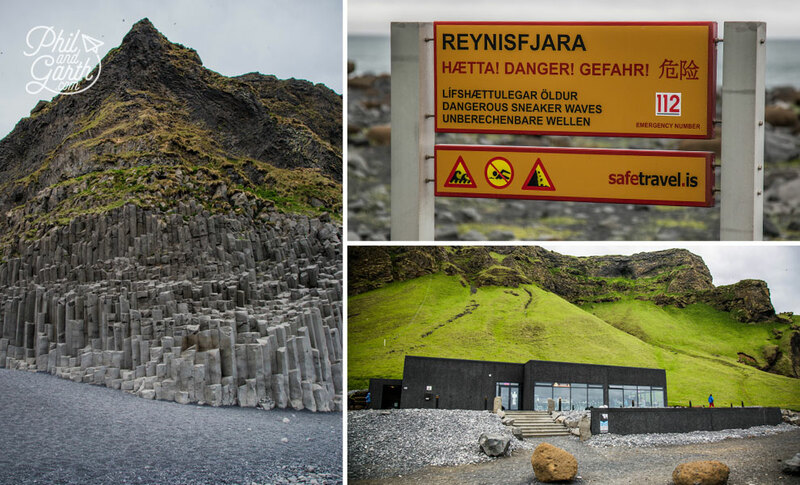 Hollywood blockbusters becomes quite a theme as you travel through south Iceland. 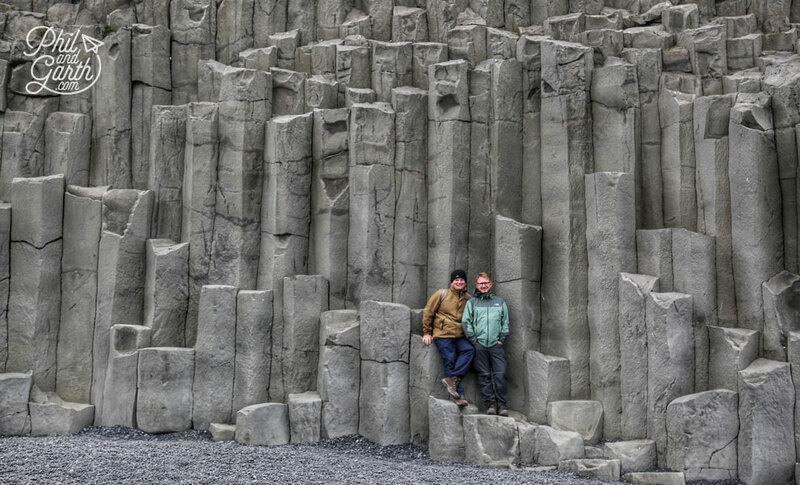 The cliffs are made from huge basalt columns that rise out of the sand, creating wonderful patterns, design in nature! If you stand back from them, they form a pyramid. Garth also loved all the standing stone sculptures people had made, there we’re quite a few. 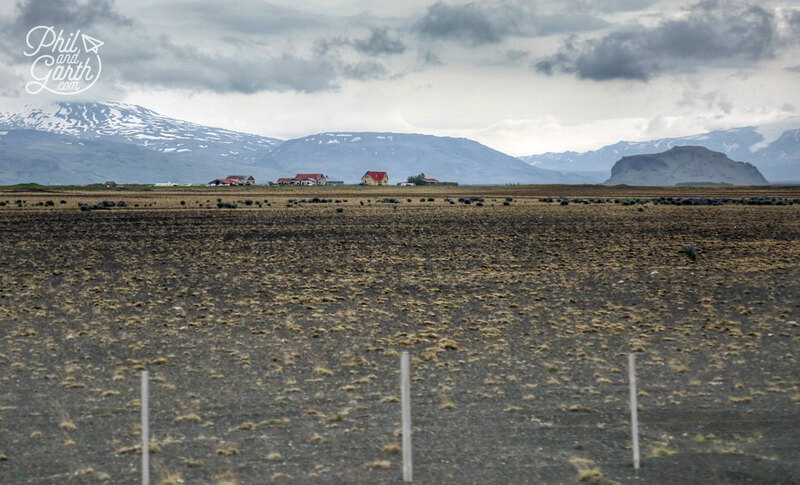 Leaving Vik we then drove for hours through miles of a lunar looking moon landscapes – barren lava planes fringed by mountains on one side and the ocean to the distance on the other. 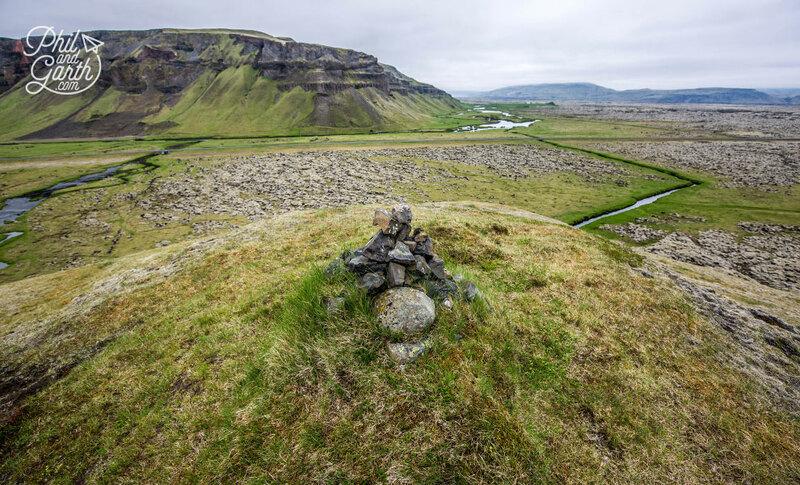 This is why we love iceland – spectualar alien landscapes! They just look completely untouched for thousands of years, and you have it all to yourself! The summer mountains are lush green and are the backdrop to pretty homes and farms dotted along the route. 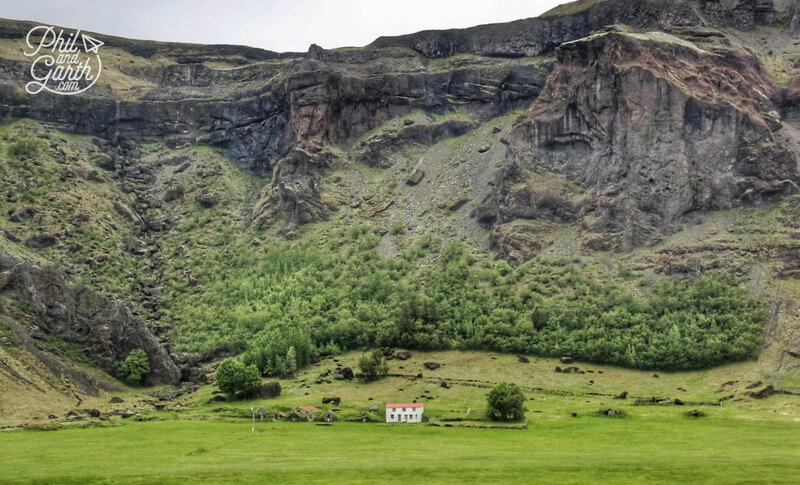 Keep an eye out for turf covered buildings that dot the landscape now and again. 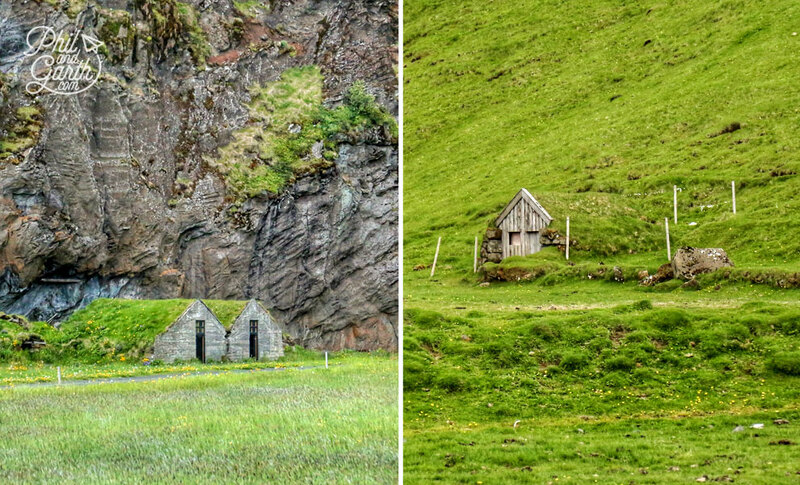 In the old days Icelandic folk would live in these toasty insulated turf houses. The ones we saw looked like animal enclosures. 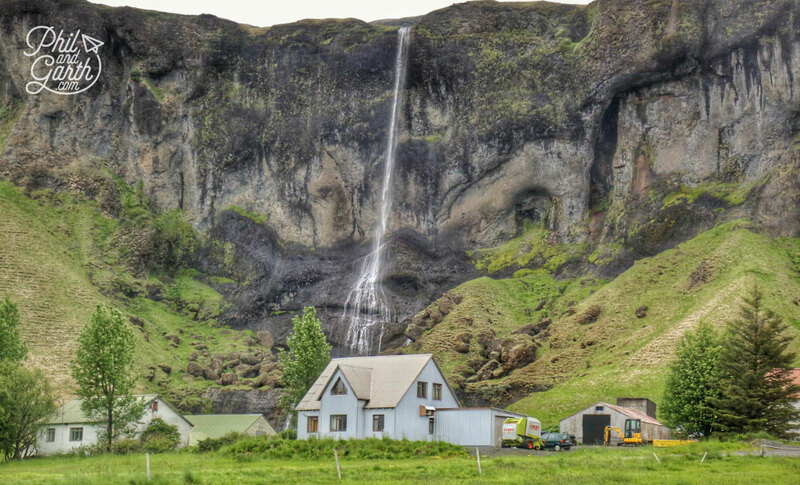 And the odd waterfall … some homes even have one in their back garden! 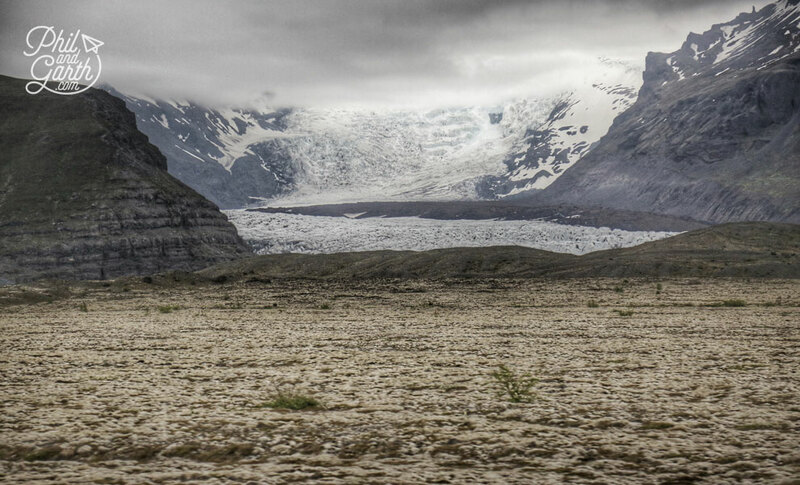 The barren landscape changes again as you get closer to Jökulsárlón. You begin to see the incredible glaciers poking out in between the mountains. This was what we’ve driven 5 hours all the way from Reykjavik to see. Magnificent iceberg calvings from the Breiðamerkurjökull an outlet glacier of the larger glacier of Vatnajökull. 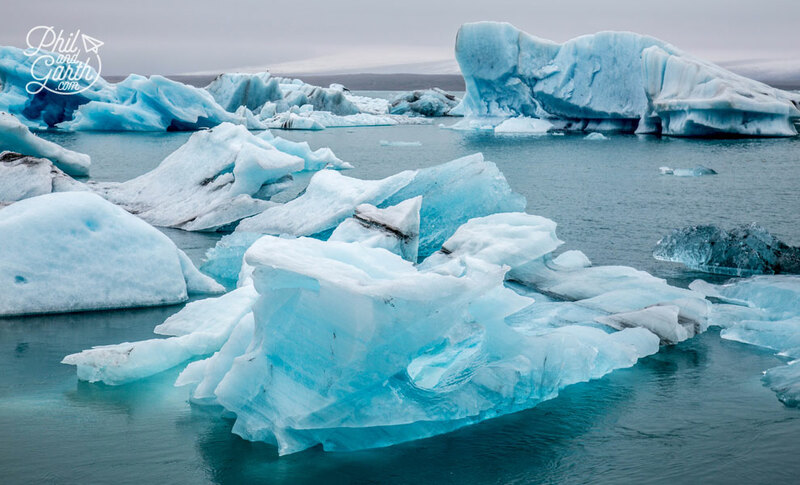 The icebergs all making their way into the Atlantic Ocean, via this jaw dropping lake, known as the Jökulsárlón Glacier Lagoon. Our first glimpse was a real wow moment. Look familiar? Well it’s been the filming locations for many blockbuster movies including James Bond, Die Another Day opening sequence was shot here, as well as shampoo and toothpaste commercials! It’s the deepest lake in Iceland at 250 metres. 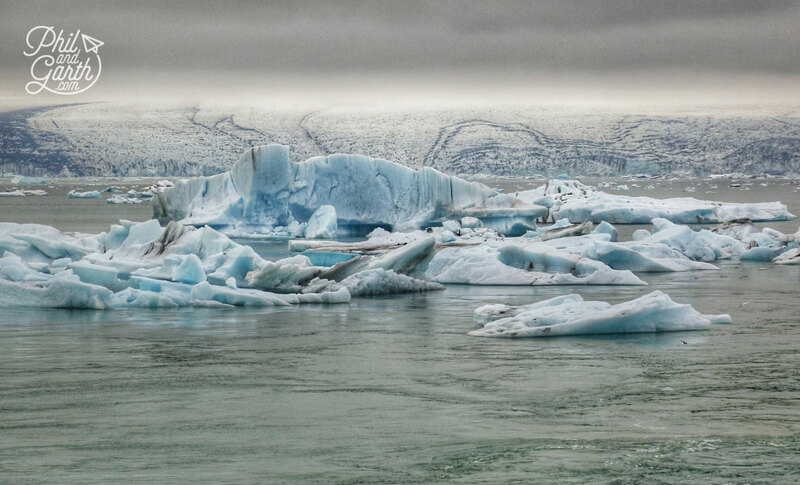 The natural beauty of these icebergs was just wonderful, a real must see sight of South Iceland. You can also wander down to the shore and really get up close and personal or even get an amphibian boat trip among them. The icebergs are much more vividly coloured than you imagine them to be, bright cobalt blue tinted whites to crystal clear ones. The bluer the colour is due to the age and greater density of the ice. At the waters edge you can hear them crack and creak. Seals are also regulars here but we didn’t see any. 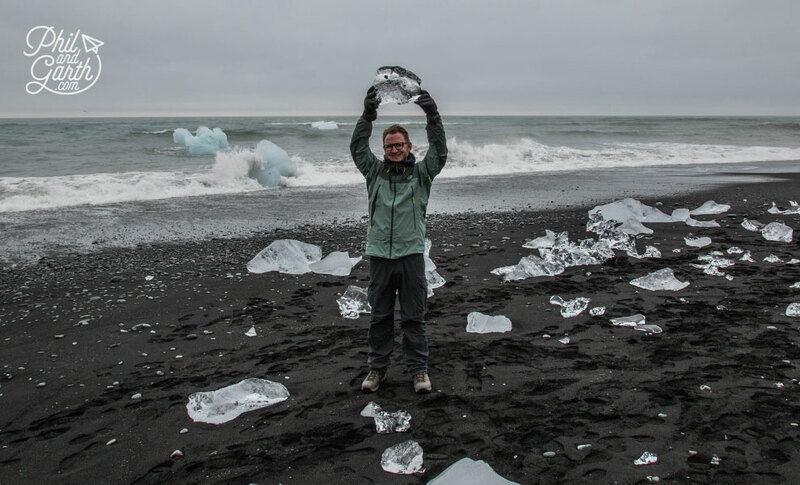 When you’ve finished at the lagoon, head over the nearby bridge to the black beach, where these icebergs meet the Atlantic Ocean. Depending on your luck you may find huge pieces washed up. 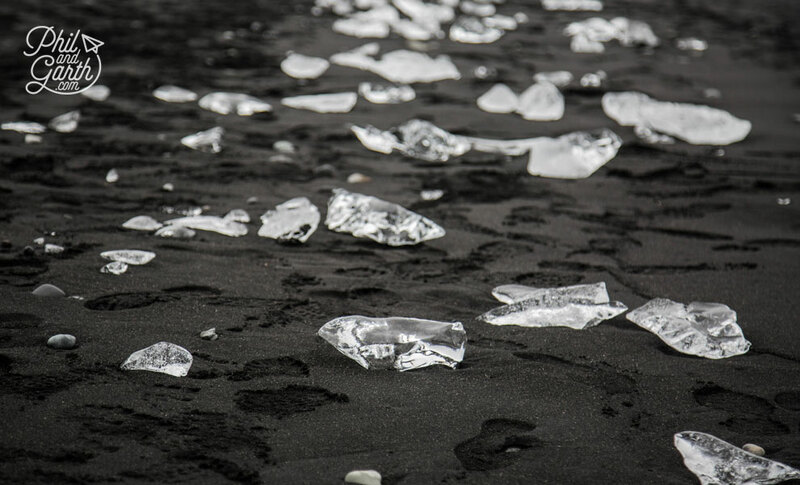 On our day the beach was covered in small chunks of ice which looked just like jewels and diamonds. 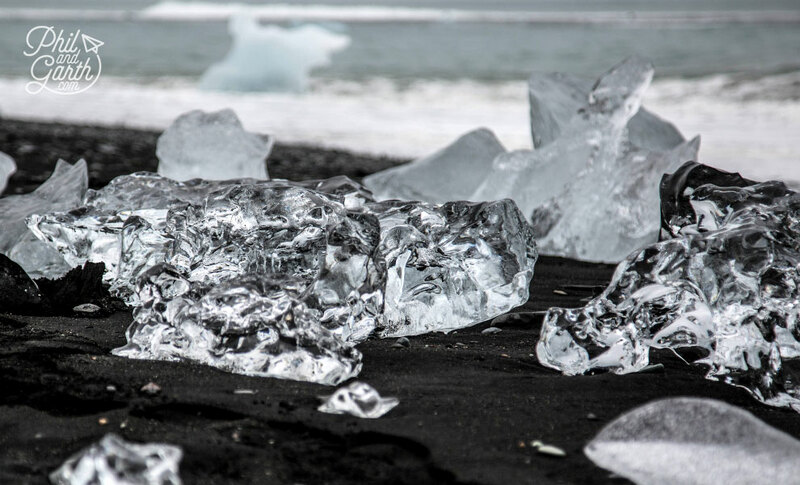 The visual contrast of white ice reflecting the grey sky set against the fine black sand, makes it an incredible place. The beach is a real favourite with photographers too, there were quite a few with tripods. 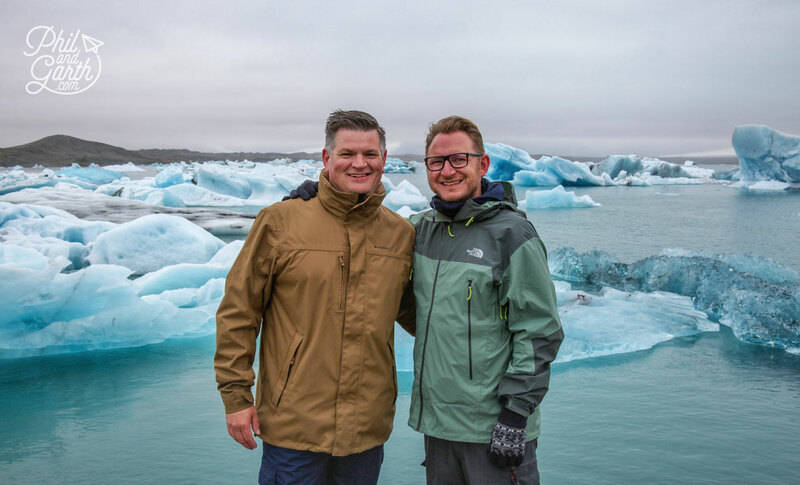 Just Google Image Jökulsárlón and you can see why. After a stop for lunch, We headed off to get fitted with crampons for our 3 hour hike with a guide from Extreme Iceland. 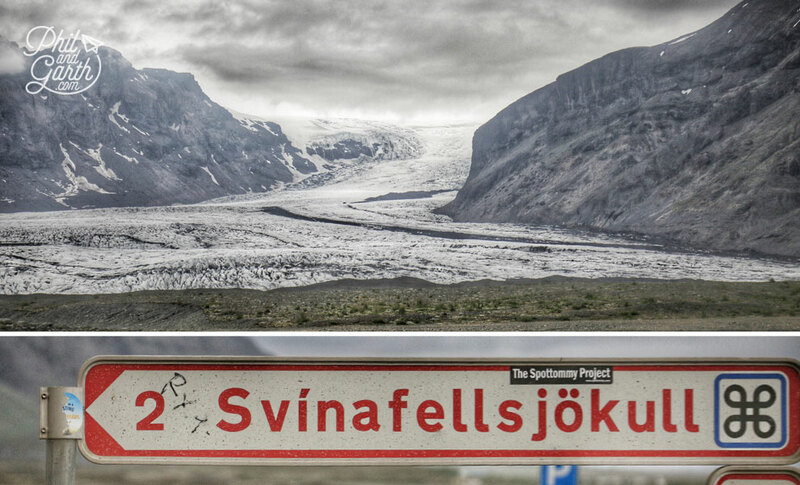 The glacier we hiked was called Svínafellsjökull in the Skaftafell area. 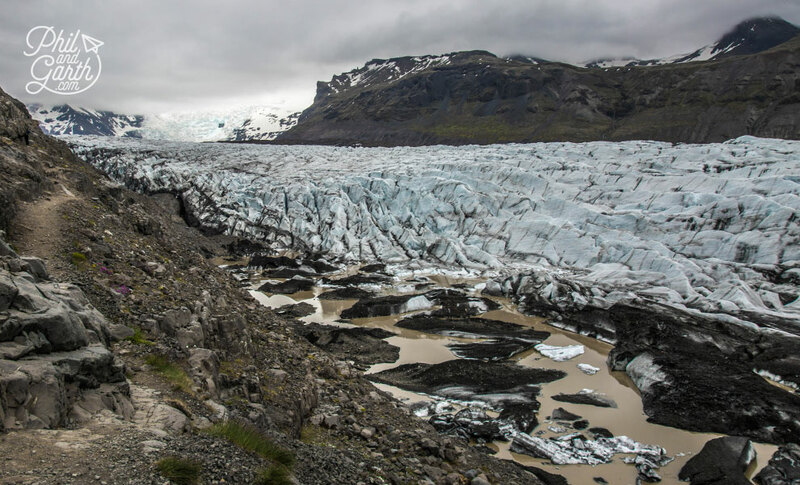 We always assumed that glaciers were frozen water, but they are actually hundreds of years worth of snow that has been compacted over the time to form dense ice. 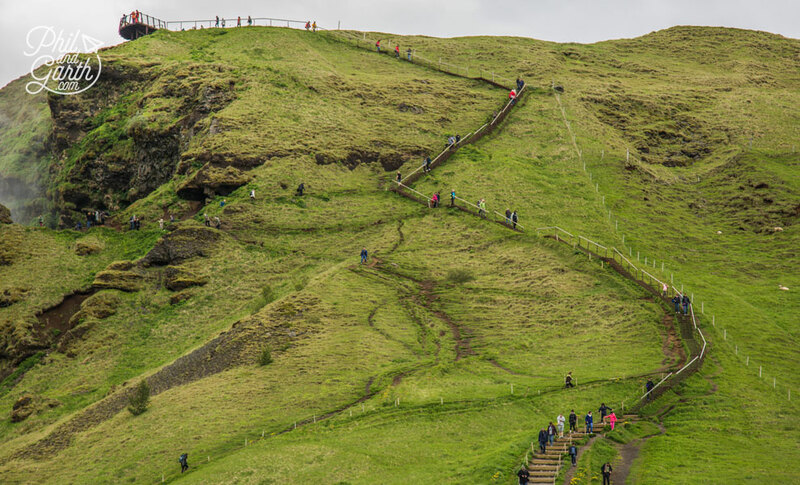 Just like the other natural wonders of South Iceland, it’s epic! breathtaking at first glance. As we made our way to the edge of the glacier, the dirty looking rock is actually the glacier – the ice covered in dirt and gravel. 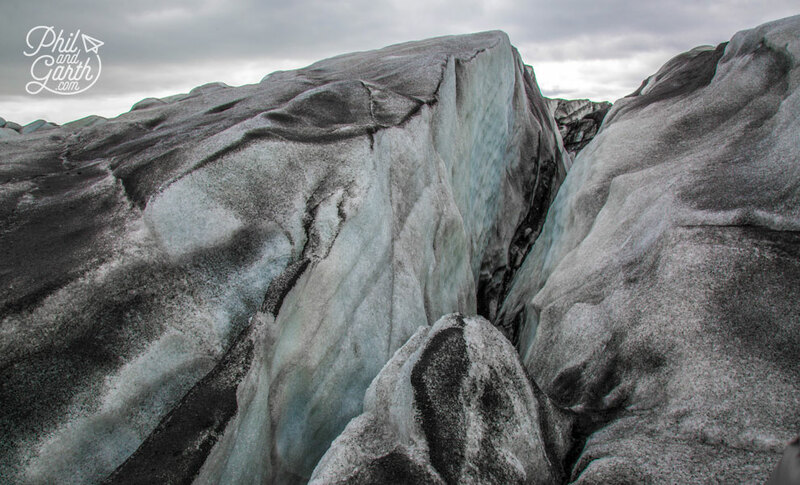 As you get further into the glacier, you realise the immensity and the danger. 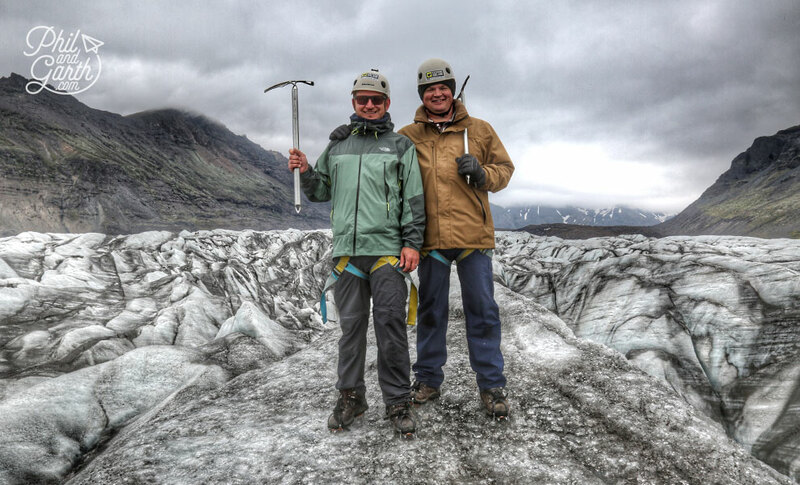 Incredibly deep crevasses are right next to you, that’s why we hired a guide! You have to stomp with your crampons to make sure you get a good fix as you move around exploring this dramatic terrain. This once in a lifetime experience will give us fabulous memories to treasure, it was also Garth’s birthday, which made it even more special. The experience of hiking on ice combined with the epic panoramic views were just incredible. Everywhere looked like one giant river frozen in time with ripple like patterns. So which Hollywood movies have filmed here? yes lots, including the brilliant sci-fi Interstellar movie. We pulled up by the side of the road also stopped for a hike up to the top of ‘Battle Hill” where you get a birds eye view of the Brunahraunlava lava fields from a volcano that erupted in 1785. The view is great from the top, looking across the lava fields and surrounding landscape feels like the dawn of time. On the way up and down you also get up close to see the green hairy moss growing on the lava rock along with other alpine like flowers just blossoming, nature really is beautiful in South Iceland. Even though it was only a few days, it was an incredible road trip, you realise how easy it is to explore untouched remote areas only a couple of hours from home. 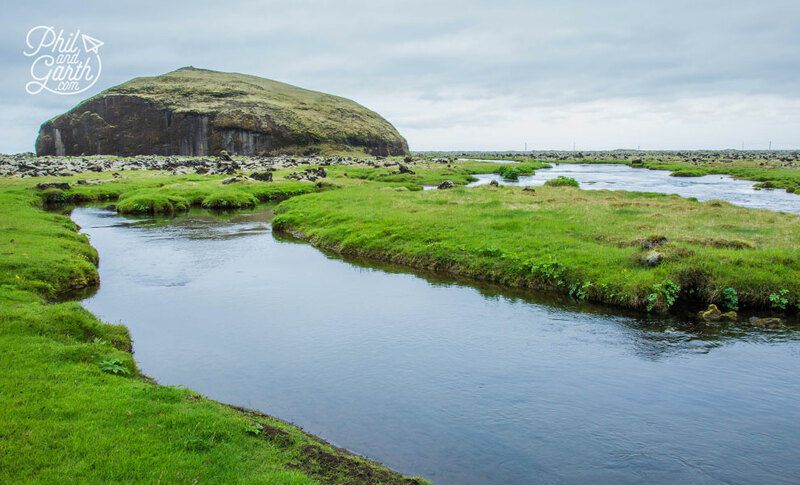 Iceland’s vastness and lack of human impact gives it the status one of the last places in Europe to be unexplored. 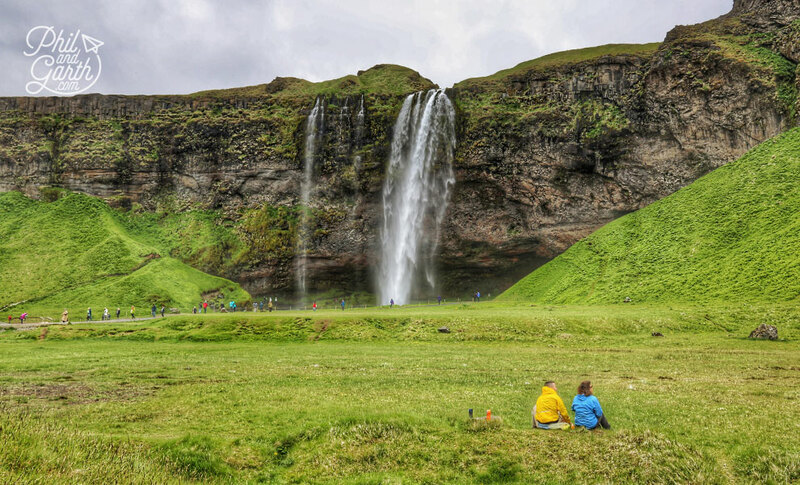 Our other observation was Iceland don’t charge you for it’s major natural attractions, unlike the UK where you would be charged an entrance fee, a parking fee and more. 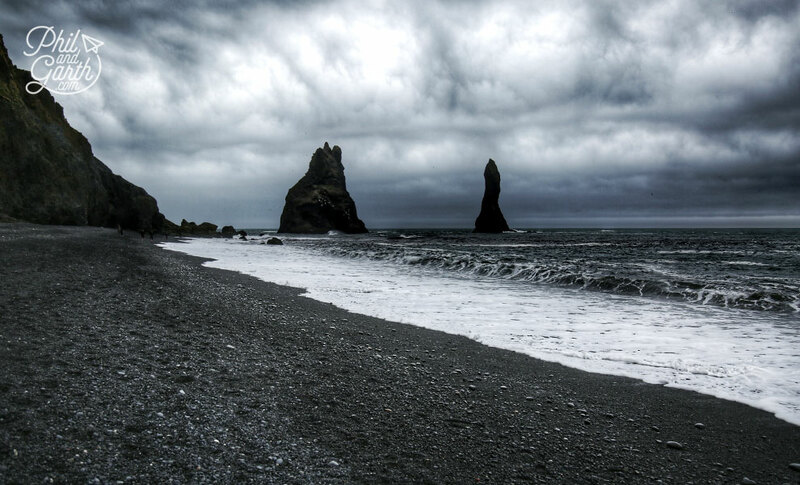 Tip #1: At the black beach, Reynisfjara – Once you reach wet sand be very careful. Atlantic waves have killed people here, so don’t turn your back on the sea. 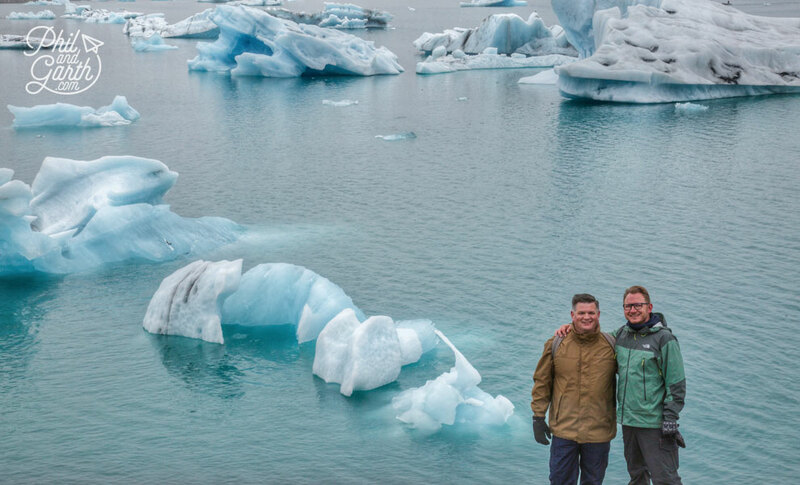 Tip #3: On the glacier hike, they don’t recommend you wear gloves, but we do. Phil slipped and cut his hand on some sharp ice. 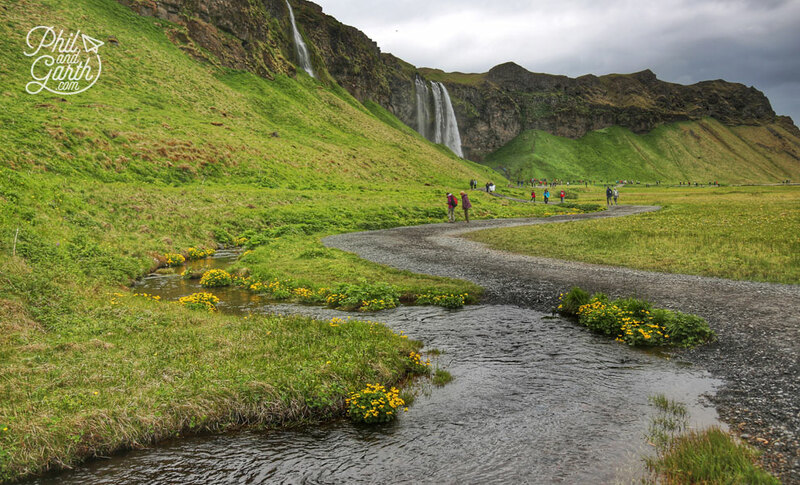 Tip #5: Everything is natural in Iceland – so is the water, and perfectly safe to drink. Hi Phil & Garth, Wow looks amazing! Can you please tell me what month were you there? Hi Jess we did South Iceland in their summer, at the beginning of June, hope that helps! We are awestruck! what stunning pictures you guys… and the video is fantastic too. Keep up the good work! Looks like what we are hoping to do next month. 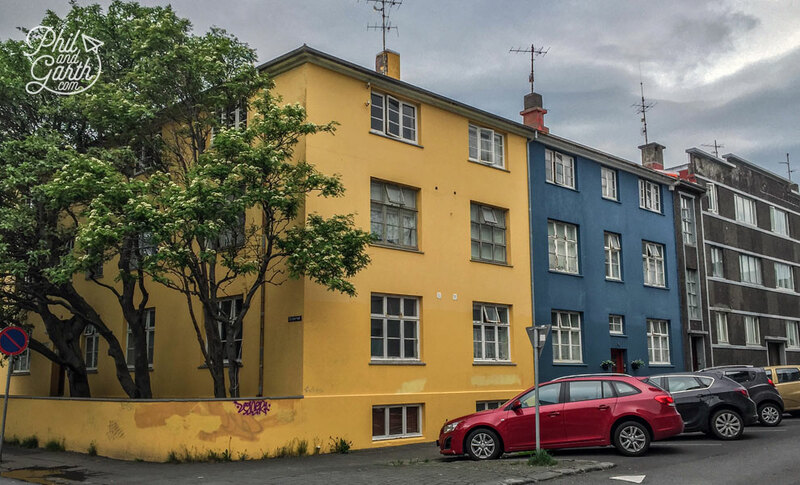 Where did you stay outside of Reykjavik? 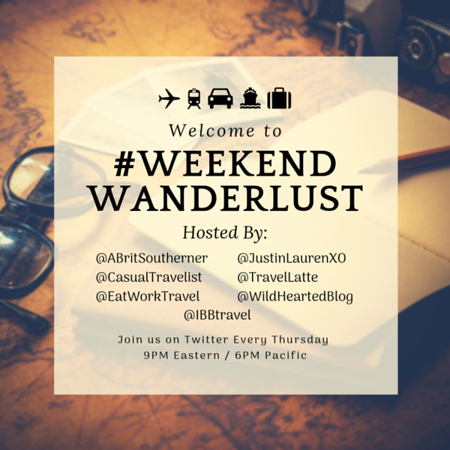 Would you recommend staying in Vik or somewhere near Jökulsárlón? Did you mind driving yourselves (does the driver miss out on scenery)? About how much gas did you consume (liters or cost)? Trying to decide if it would be better to hire a tour or self drive. Any advice would be welcome. Astoundingly beautiful! I need to get to Iceland one of these days. They really grow bananas there? Thanks for your comments Connie, It really is beautiful and ranks right up there as one of our favourite countries. And yes they really do grow bananas in Hveragerði ! Wow! 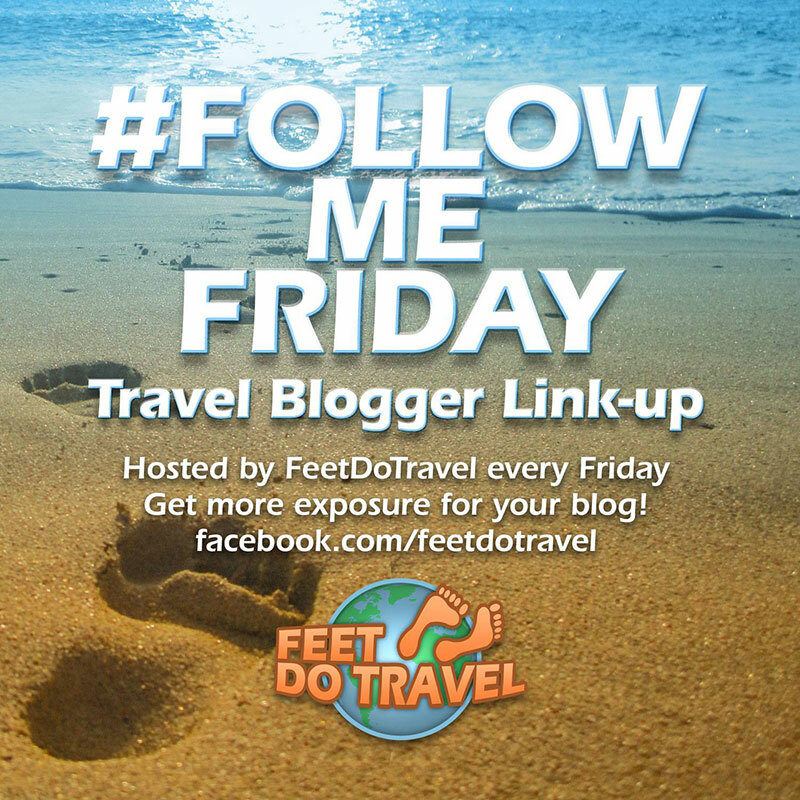 You have some amazing photos here, of some equally amazing landscapes! Thanks for sharing, and showing us how gorgeous it is! Just incredible. I literally found myself holding my breath while going through your photos, in awe of how beautiful, picturesque, and unreal Iceland is. 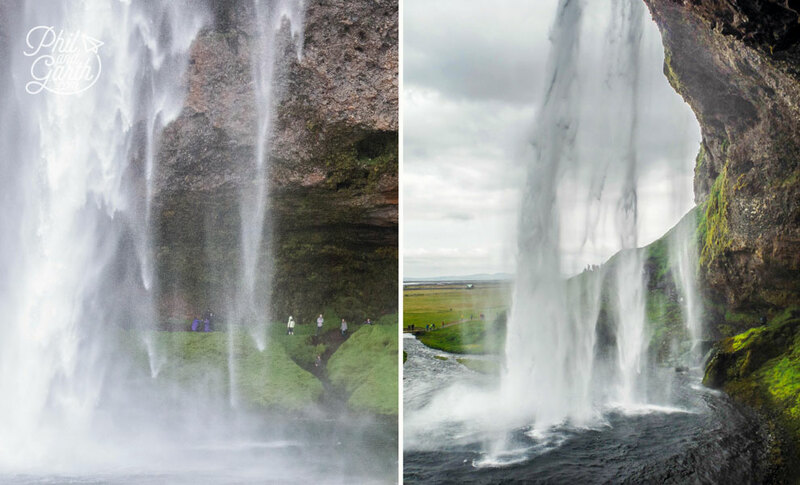 This just solidifies our decision to go to Iceland this November. We keep getting more and more inspired by every post and photo we see! The photos you took of waterfalls and beaches are my favorites, I think. 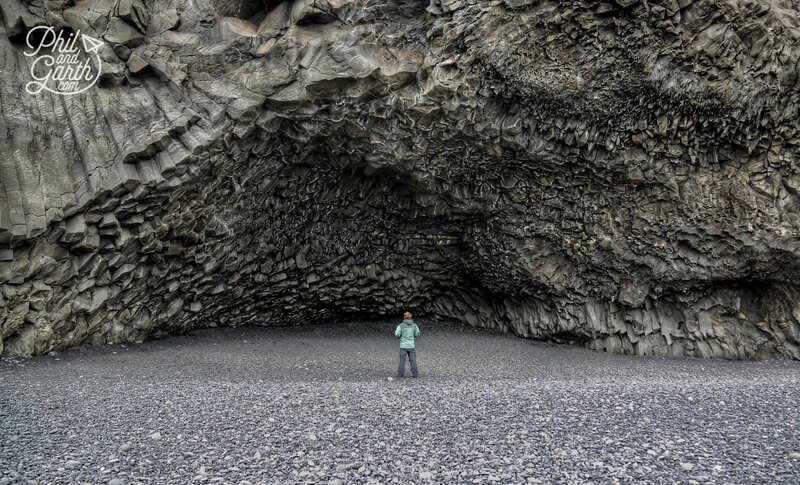 I can’t believe how tall some of them all, and those beaches with black sand are like something out of a fairy tale. Completely magical. Thank you for sharing about your trip! thanks for your comments, so happy it inspires you to go! Iceland is truly is one of favourite countries in the world! November sounds great, hope you guys get to see the Northern lights! 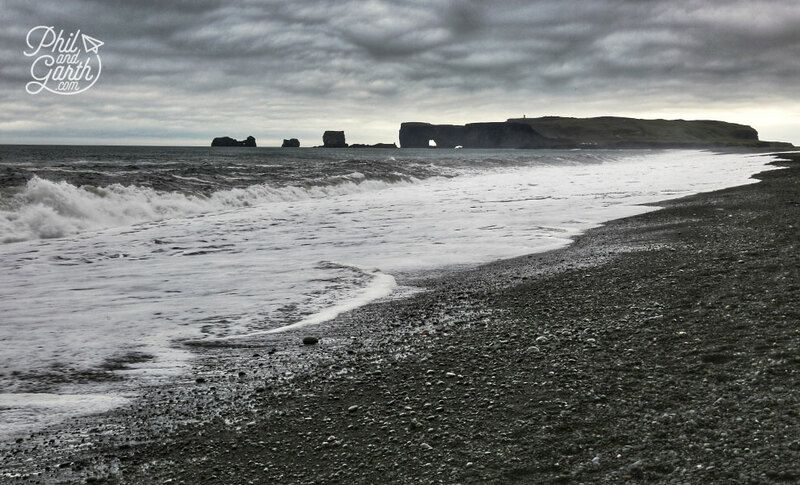 I adore the south coast of Iceland. 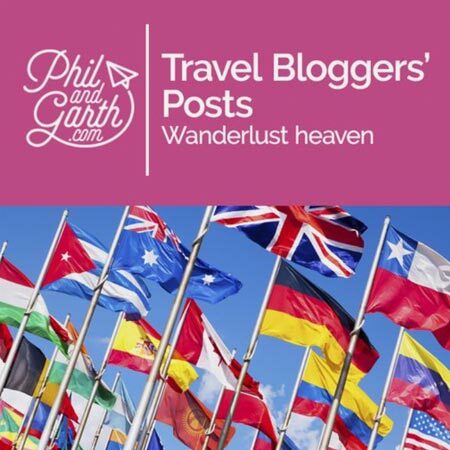 I have a similar post on my blog, including the glacier walk with Extreme Iceland! Although, I must admit my photos don’t hold a candle to yours, they’re simply beautiful. Definitely one of the most beautiful places in the world. I’ve just read your blog post David, yeah seems like we did the same things! love your pics of the Icelandic horses, we saw some on our previous trip but not on this one. Agree definitely a beautiful country. Just stunning as always guys! 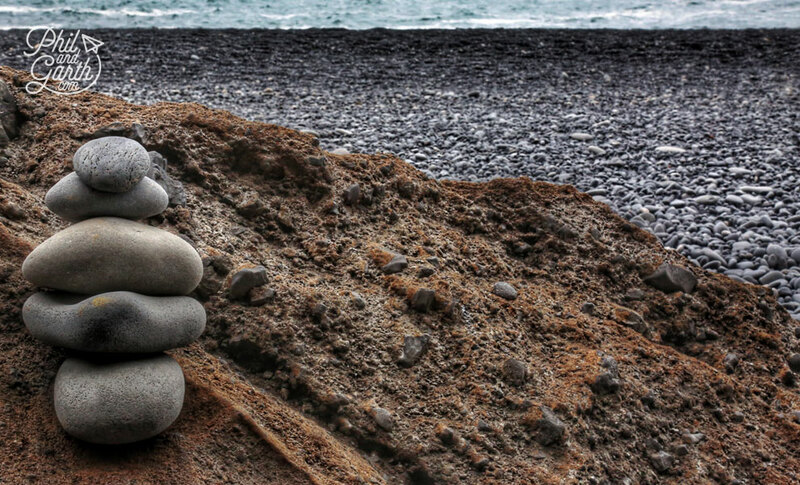 The black sand beach looks incredible. Iceland is getting higher and higher up my bucket list. I’m sure in the wake of their footballing exploits putting them on the map, I won’t be the only one looking to visit as soon as possible! Thanks Lexx. You’re right it’s becoming a more popular destination. 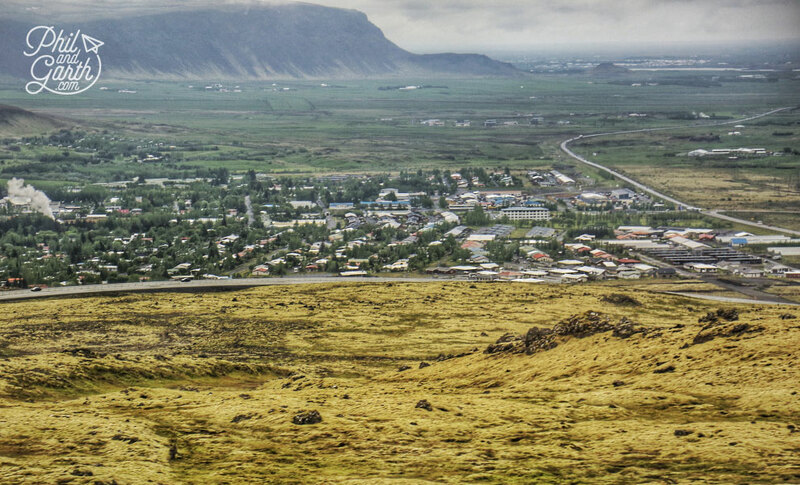 Someone said to us Iceland has more tourists that it does residents now!